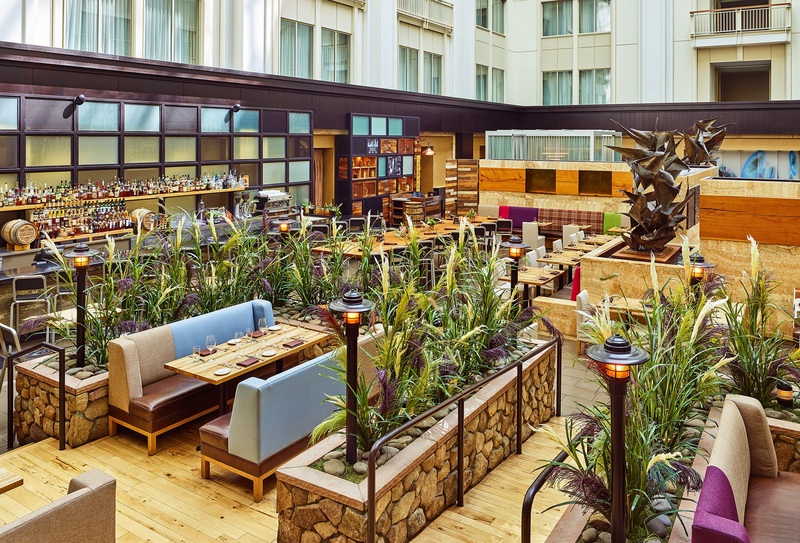 Located in the Nines Hotel in Portland, Urban Farmer Restaurant redefines the modern steakhouse. 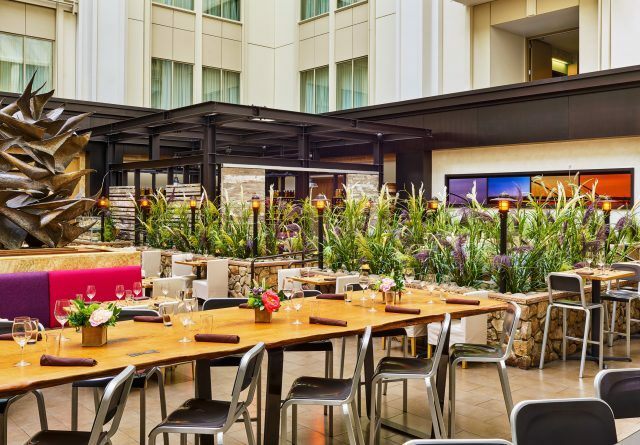 Redefining the modern steakhouse with an emphasis on Northwest, sustainable ingredients and simple, straightforward preparations, Urban Farmer Restaurant offers a range of beef options including grass-fed Oregon beef, pasture-raised, grain-finished beef, as well as corn-fed beef. With an expansive wine list and cocktails made with many local spirits, the beverage program extends the concept of local and sustainable. The bar even delivers a Moonshine punch with locally crafted moonshine whiskey blended with grains from a local brewery. New York City designer David Ashen created a country chic ambiance using organic, reclaimed and modern materials. Whether you’re looking to enjoy breakfast, lunch or dinner in Portland, Urban Farmer Restaurant is open seven days a week. The country décor uses organic, reclaimed, and modern materials as a backdrop for the fresh fare, including the twenty-foot communal table sourced from an old-growth Douglas Fir. The spacious “Deck” captures the spirit of outdoor dining, while a field of wheatgrass in the room’s center completes the sensation. For a truly cozy experience, the “Pantry” offers an intimate setting with walls of steel and reclaimed timber, as well as shelves stacked with vibrant jars of pickled fruits and vegetables. Featured beef includes award-winning American Wagyu from Strube Ranch in Texas, all accented with sophisticated spins on traditional steakhouse side dishes. Sample roasted squash with candied almonds or braised greens with sunchokes. Save room for dessert, all playful takes of classic American sweets. Apple crisp with pumpkin pie ice cream and carrot cake with pineapple sherbet and carrot soda are menu highlights. Round out the meal with a bottle of your favorite drink, many of which are secured through partnerships with local distilleries, breweries, and wineries. All wine is sourced from winemakers who prioritize sustainable, organic, and biodynamic farming, in keeping with the restaurant’s overall philosophy. Lauded Designer David Ashen has created a unique restaurant space at Urban Farmer Steakhouse within the larger 8th floor atrium lobby. Urban Farmer’s menu honors national and local culinary traditions and sources ingredients from some of the Northwest’s finest eco-friendly producers. A video installation by one of Portland’s favorite experimental artists, Matt McCormick, rolls stunning images of the city’s rural and urban landscapes while diners indulge. The wine list includes nearly 200 varietals found in Oregon, Washington, and California, as well as over three-dozen world-class wines from Willamette Valley, Oregon.